Just spray it on and the stains are gone! 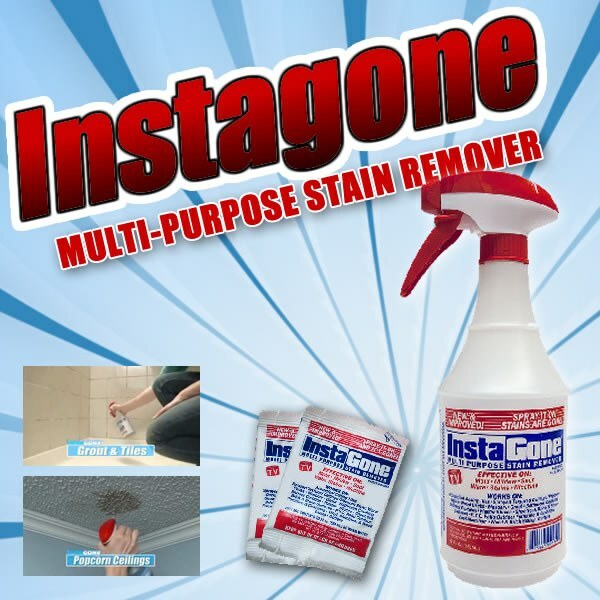 Instagone multi-purpose stain remover means no rubbing, no scrubbing, and no wiping! Spray it on, watch them disappear! No rubbing! No scrubbing! No wiping! Spray it on and the stains are gone! Works on mold, water stains, mildew, nicotine, rust, soot, and more. Includes: One 22 oz spray, and 2 x Pre-measured packets of super-concentrated, ultra-oxidizing InstaGone Stain Remover. Works GREAT on my outdoor resin patio chairs and on vinyl boat seating. Better than expected! Easy to get rid of that mildew now! I won&apos;t use anything else! It does all the advertisement stated. Well pleased with the product! Not as good as I had hoped for. Not working as well as expected but ok.
Works well, but my black mold is bad, wish I could just wipe it on are area ,my lani is covered in mo lmk d, now it has stripes! Product works took mold out of my bathroom and my sons, no wiping! !